Kylie Jenner is businesswoman worth millions, but self-made? Hmmmm. Forbes, the financial magazine of note, one we trust to be honest about the revenues and salaries of celebrities and Silicon Valley CEOs, printed a glaring error on its August 2018 cover. No, the mistake wasn’t about $900 million the 20-year-old reality star is reportedly worth. That part’s true — Jenner will soon become one of the youngest billionaires, even out-pacing Facebook CEO Mark Zuckerberg. Forbes actually expects its readership to believe that Jenner built her cosmetic and social media empire all on her own. Naturally, the people of the internet were collectively taken aback — and we don’t do that often. Well, I did my Googles. Nowhere could I find in the Merriam-Webster’s, the Oxford English, Dictionary.com, or even the Urban Dictionary, that “self-made” meant using your family members’ wealth, fame, and publicity stunts to launch a successful business. Correct me if I’m wrong, but when I think of a self-made business owner, the bootstrap theory comes to mind. These people are determined to make it, often dreaming from a lonely island sans free publicity or investors. Self-made is literally the process of turning nothing into something. Self-made business owners put in the hard work and still feel lucky to have achieved sustainable success. Now, I’m not knocking her hustle, but let’s not act like she’s been in the basement eating ramen noodles and sleeping on an air mattress. Psst. When have we known Kylie Jenner for modeling? Another part I found humorous (as well as genius because … let’s be real) was that she outsources most of her work to China and only has 12 employees, so she can do the hard job of posting selfies on social media all day. This grind isn’t for the weak, people. Well, I won’t be fooled by the media’s trickery. Take a look at some actual bosses who built their businesses without the free publicity from E! or masterful P.R. from Mama Kris. I can say with great confidence that Myleik defines the meaning of the word “self-made.” She built her monthly natural hair subscription box to fill a void in the beauty industry and changed lives in the process. She went onto launch her addictive “MyTaughtYou Podcast” (I haven’t missed an episode), and her annual MTYRetreat (I went on the inaugural one) to help other aspiring CEOs. Self-made. No frills. A self-made boss needs to know how to bounce back in the face of defeat. That’s exactly what Melissa Butler had to do when her lipstick line, The Lip Bar, was shut down by the venture capitalists on “Shark Tank.” They said her brand wasn’t marketable, and now she’s on the shelves in Target. This is the grit of a self-made queen. Courtney Adeleye takes the “self-made” label and defines it x 1,000. She started out around the time Instagram launched, just posting casual photos of her envious mane. Her followers turned to her for hair advice in hopes of getting the same luxurious, natural hair look. Adeleye took her products from the kitchen and started producing them for her audience. Just a few months later, The Mane Choice was born. The hair care line was just a start. Adeleye has launched several businesses including Foolproof Body and an actual show called “Who’s the Bawse” to help other CEOs. Kylie Jenner, look out! 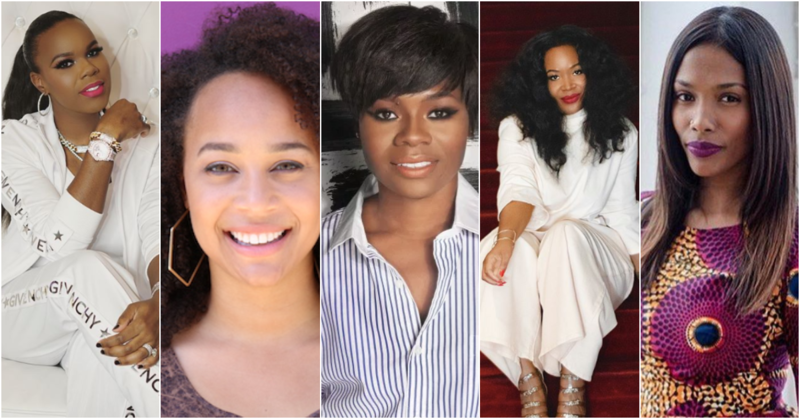 You can definitely call yourself a self-made boss when you have more than 12 employees and own several of the most popular websites servicing the culture and people of color. Such is the case with Blavity Inc. CEO Morgan DeBaun. When it seemed the internet media world was ignoring the interests of people of color, DeBaun slid into the spectrum with Blavity, 21Ninety and later acquired Shadow and Act and TravelNoire. That’s a self-made glow up! It’s been said that you can only be in Diddy’s orbit if you harbor a hustler’s spirit. Before becoming the event planner du jour, Karleen Roy started off working as an executive assistant to the Bad Boy CEO. She’s flown all around the world under the music mogul’s wing. Now she’s doing her own thing as the head of The Vanity Group, a luxury lifestyle management agency. This year alone she’s planned some of the hottest events in entertainment including Cardi B and Offset’s Atlanta Baby Shower, Quavo’s Huncho Day, and Carol’s Daughter anniversary event in Washington, D.C. Boss!Kylie Jenner is a boss and that’s admirable, but self-made is a stretch. Let’s help Forbes out — drop the names of your favorite self-made bosses in the comment section.